Narrative: At 0256 the call came into TFD's dispatch center reporting a possible structure fire. The first arriving company (Battalion 2) was onscene at 0259 and reported a 3-story residential structure with light smoke showing from floor 1 and 2 and heavy smoke showing from the roof. The residence was reported as to be set uphill and well off the road. The first engine company onscene made access and attacked the seat of the fire on floor 2 with an 1 3/4" preconnect hoseline. The first ladder company assessed the ventilation needs and performed vertical ventilation on the roof. Fire was reported to have spread to floor 3 and an additional attack line was initiated to attack the fire on floor 3. At 0323 the fire was reported extinguished by the Incident Commander. The American Red Cross was activated and assisted 12 displaced residents. One individual was transported to a local area medical facility. The fire is currently under investigation from the Tacoma Fire Prevention Bureau. Tacoma Fire Department (TFD) is currently seeking candidates who would like to serve our community as firefighter. This is your opportunity to join one of the most progressive, innovative and dynamic fire departments in the nation. TFD takes great pride in its ability to serve the needs of our diverse community and each day our citizens call upon us to respond to a variety of emergencies including: structure fires, emergency medical responses, hazardous materials incidents and technical rescue situations. If your interested in becoming a member of the TFD team, check out the details and complete the on-line job application. Incident Location: 1518 S Alder St. Narrative: At 6:15 p.m. 9 companies of Tacoma Firefighters (4 engines, 1 Ladder, 1 Medic Unit, 1 Safety Unit and 2 Command Units) responded to a reported residential structure fire. First arriving companies found a single story residence with heavy smoke and fire showing from the attached garage. The first arriving engine crew attacked the fire with hand lines, while other companies conducted primary search and rescue, additional hand lines and ventilation. The occupant’s dog was located safely and removed from the smoke filled home by the Medic Unit conducting search and rescue operations. 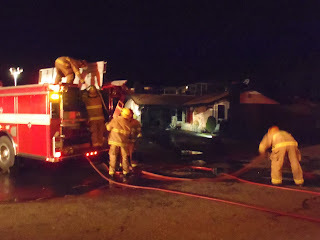 Firefighters were able to keep most of the fire from spreading from the garage to the living area. However, the four occupants of the home were forced to relocate due to smoke damage. Narrative: At 3:02 p.m. TFD dispatched units for an automatic water flow alarm in a commercial building. The first arriving company found water cascading down from the ceiling onto the interior loading dock area of the food distribution business. Crews quickly shut off the water and power supplies and began the process of clearing the water from the business. Orders were given to evacuate the building when it was determined that a the large amount of water was trapped in the space between the roof and second floor ceiling. The volume of trapped water was heavy enough that it represented a collapse hazard to the structure. After a couple hours of draining the water, crews were able to safely make entry into the space and determine that a fire suppression sprinkler head had burst, activating the fire pump and three additional sprinkler heads. The cause of the bursting sprinkler head is under investigation.